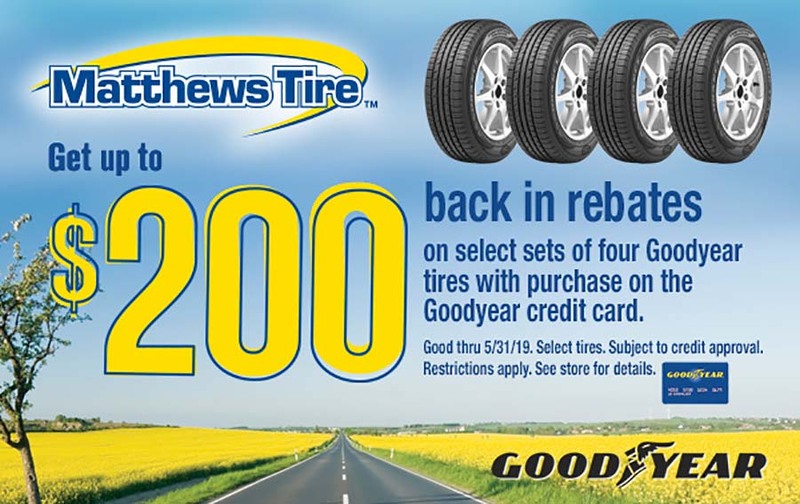 Matthews Tire™ is pleased to offer our customers coupons, monthly specials and frequent rebates. Check our website, “like” us on Facebook and check this promotions page often to stay updated on our current offers. Let us help you at 1 of our 6 retail locations. Also, don’t forget to apply for a Goodyear credit card and get special offers just for cardholders! Lube (where applicable), new filter, up to 5 quarts brand name oils (brands vary). Special diesel oil and filter extra. $25 off any service over $200 at all Matthews Tire locations. Most vehicles. Some restrictions apply. See store for details. Excludes tires. No commercial accounts.